Delta Cephei is a famous variable star in the constellation Cepheus. With clock-like precision, this rather faint star doubles in brightness every 5.36 days. You can see the brightness change best if you contrast this star to others nearby. The constellation Cepheus requires a dark sky to be seen, but if you can spot this constellation, you might be able to find the variable star. You will find it high in your northern sky on November and December evenings. The pattern of stars in Cepheus resembles a stick house, the kind we all drew as children. The variable star – Delta Cephei – is located near the bottom corner of the house pattern. Cepheid variable stars are a class of stars named in honor of Delta Cephei. They are known as pulsating variables. 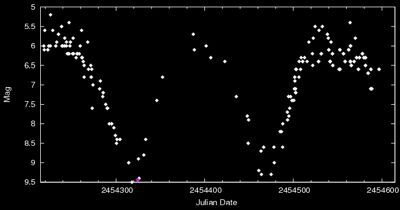 The image at right is what astronomers call a “light curve” of a variable star. Each point represents the brightness of the star at a particular time. You can see that the star’s brightness changes in a regular way over a period of days. The brightness of a Cepheid variable star changes because the star is actually expanding and contracting in size. The radius of a Cepheid variable star changes by several million kilometers (30%) as the star expands and shrinks. There is a very precise relationship between a Cepheid variable’s luminosity and pulsation period. For that reason, these variable stars serve as standard candles – in other words, their true brightness is known, so astronomers can see how bright they look to measure the distances to the stars – and hence to faraway galaxies. Now look again at the chart at the top of this post. 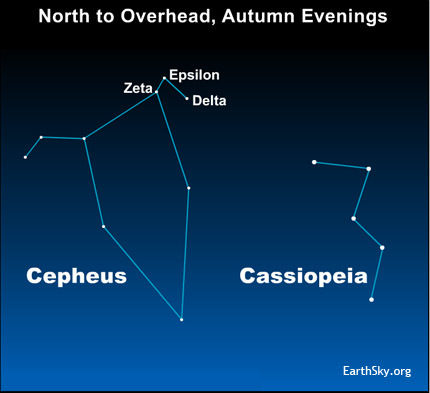 In the actual sky, the two stars near Delta Cephei – Epsilon Cephei and Zeta Cephei – mark the low and high ends of Delta Cephei’s brightness scale. At its faintest, Delta Cephei is as dim as the fainter star, Epsilon Cephei. At its brightest, Delta Cephei matches the brightness of Zeta Cephei.